Last week Dave wanted to make homemade whipped topping but we didn't have quite enough heavy whipping cream so he added skim milk thinking it would be okay. When it didn't thicken he added some powdered sugar. It still did not thicken enough to make it whipped cream. I suggested that we add some of our fat free, sugar free white chocolate pudding. BINGO! IT WORKED! I mixed it with a mixer on high until it formed peaks. Talk about YUMMMMY!!! He served it over fresh fruit. Tonight he's having the young men over here for an activity and we are going to serve it over funnel cakes with strawberries! I have even thought of using it as cake filling, or filling eclairs. The kids love it and we were not sure of what to call it so we started calling it OOPS! because it was discovered by accident. For those of you who would like to try our OOPS, here it is. 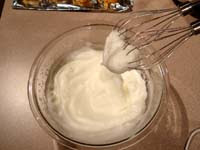 Mix with electric mixer until peaks form. Put it in fridge for 10-15 minutes to chill. Serve chilled & ENJOY!...We do! That sounds really yummy! We'll have to give it a try sometime!